Hoboken Divorce Mediation - New Jersey Family Mediator & Divorce Mediation Services. Divorce is a Major Transition that Can Impact Almost Every Aspect of Your Life. Divorce mediation with Hoboken Divorce Mediation, L.L.C. can help you to understand the process to overcome your fears and follow a constructive, respectful, efficient and cost-effective path to a resolution with dignity that can benefit everyone involved. Mediated agreements can allow for creative resolutions tailored to your family's goals in ways that litigation cannot. Often, but not always, mediation can be the best approach for you, your spouse and for any children involved. As a family law attorney with over twenty five years of experience and a R. 1:40 Qualified Family Law Mediator, Karen Kirchoff Saminski, Esq. 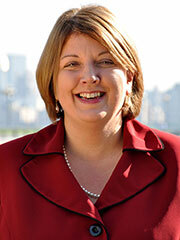 brings her knowledge of family law and mediation as well as her negotiation skills to her new mediation practice. By choosing Hoboken Divorce Mediation, L.L.C., you will have access to a broad network of trusted professionals that Ms. Saminski has worked closely with over her 25 year career as a Family Law attorney. With the availability of information from all professionals needed to move the mediation forward, mediation is conducted in a civilized, expeditious, efficient and cost-effective manner. With Hoboken Divorce Mediation, L.L.C. you will experience a dignified respectful process on a schedule that works for you. If your case presents as one of the cases in which mediation is not the most appropriate process, Ms. Saminski will clearly outline the reasons to both participants in a joint meeting. Please visit Ms. Saminski's law firm website at www.karensaminski.com for further information. But please note that Ms. Saminski cannot act as mediator and attorney in the same matter. Ms. Saminski's mediation services may also be used in other family matters such as separation agreements, grandparent issues, domestic partnerships, and post judgment disputes.